I walked by a dealer’s table at Cinevent where a monitor was playing cartoons. Not Disneys or Popeyes nor Looneys. This was animation off a twilight zone many fans don’t even know. Short of passing middle age with memories of very early television, chances are you wouldn’t either. Thunderbean Animation was the vendor and he was selling Van Beuren cartoons on DVD. Steve Stanchfield maintains an ongoing archeological dig for VB’s. They’re forgotten to a point where you wonder if such eccentricity is for real (and so many!). Stanchfield unearthed them from closed rental houses, private collections, maybe Egyptian tombs. He’s of a new breed of restorationist that brings forth wonderful DVD compilations without leaving the house. Advancing digital technology makes that possible now. Much of silent film lately revived has come about in this manner. Given the brains, plus Stanchfield’s tenacity for locating treasure so long buried, any of us might generate the definitive John Bunny/Flora Finch collection right at our desks. The Van Beurens are public domain and all have scars to prove it. What Stanchfield has done to rescue them is nothing short of miraculous (it’s taken years). Original titles and sections shorn decades ago are put back with color rejuvenated to better suggest what many of these looked like when new in theatres. The Van Beuren series was over and out by 1936. What preceded that were buckets of shorts bearing his imprinteur. Honk now if you’ve encountered Cubby Bear, Tom and Jerry (not the cat/mouse team), and Molly Moo-Cow. All were new to me other than mentions in cartoon tutorials. Word is they gamboled over TV once upon a pre-me being born, and devotees speak longingly of watching Aesop’s Fables and Rainbow Parades (minus original color, natch) on primitive tubes. Why couldn’t I have arrived seven or eight years sooner? That way I’d be closer wired to Van Beurens and love them perhaps best of all cartoons, a sentiment not uncommon among dedicated followers. There’s joy in discovery, however. How often do we come across whole trunks of such unseen and wildly unpredictable fare? I’ve watched sixty at least since getting back from Columbus, not enough to address them with authority, but game to hopefully convey how much fun VB’s are and how all GPS readers might profitably seek better acquaintance with them. Disney expatriates had no Walt to guide them. A jaundiced and surly lot at times, they bounced among cartooning shops that fought for scraps from WD’s table. Talent raids were common and loyalty to employer’s easels was rare. Artists then would probably have earned more with shovels than a pen. Van Beuren animators tended to pass through on ways to better work elsewhere. The place seems to have been pretty much a galley minus oars. VB himself was less creator than overseer. He’d eventually occupy a wheelchair and no doubt evoked Lon Chaney in West Of Zanzibar for despotic ways with payroll-ees. 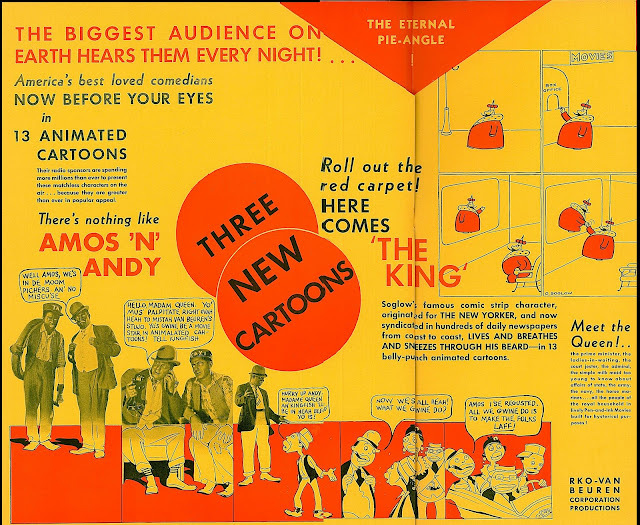 RKO released Van Beuren’s cartoons once sound came in. That distributor knew and pointed out deficiencies of VB output as it suffered in comparison to Disney’s, but demand for drawings in motion was acute, and balanced programs needed something to throw up against Mickey Mouse. Van Beuren simply copied the latter with ersatz rodents virtually indistinguishable from Walt’s. Said pilfery was routed in court, but what were rival’s options beyond imitating Disney? There were only so many animals you could make cute and funny. A cat, a rat, or a dog could achieve stardom same as Garbo, but short of Walt’s example, cartoonists seemed clueless. There were scrambles at Van Beuren as on every corner to find a character the public might latch onto. Hot cartoons had coattails weak features could ride in on. Animators were constantly pressed to find the next Mickey or Popeye, these by far the most popular cartoon names during the early-to-mid thirties. Two routes seemed open. One was to adapt comic strips to movement. Van Beuren tried that with The Little King, an expressionless figure off the dailies that never clicked in movies, despite theirs and later effort by others. 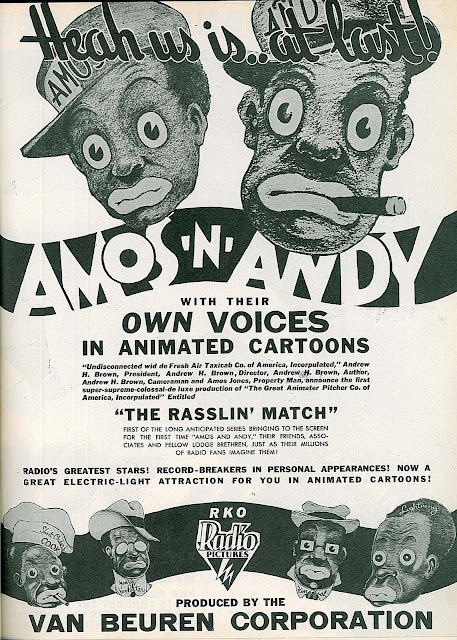 Another doomed venture saw radio’s Amos n’ Andy proposing new life in cartoons. Trade trumpets blared louder here than for any Van Beuren previous or hence, but something went badly wrong with A&A creators Gosden and Correll, their abandonment of the series choking it off after just two entries (both The Rasslin’ Match and Lion Tamers are on Thunderbean’s Uncensored Cartoons DVD). Efforts at originating characters for Van Beuren cartoons met failure of a kind intriguing to analyze all these years later. 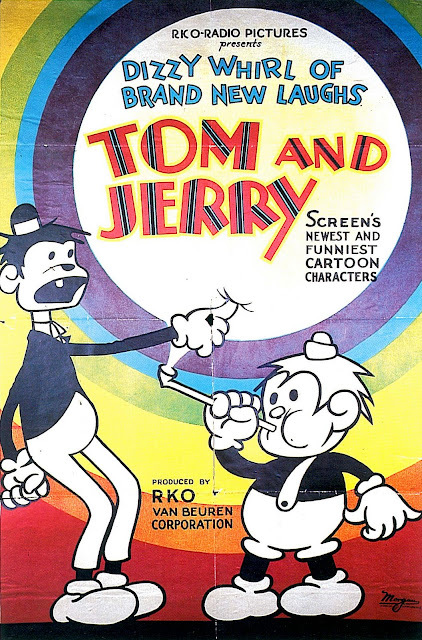 Despite having looked at a half-dozen Tom and Jerry shorts, I’m barely able to call up specifics as to who they were or what they did. One was short and the other tall. They’re human, I think. Every time one passes a piano (often), they stop to play and sing, not helpful toward momentum cartoons need, but sometimes conducive to bizarre and/or precode liberties not taken by closer monitored Disney and similarly high-profile cartoon suppliers. It was indeed that very obscurity of Van Beuren that kept roads open toward the offbeat and unexpected. Van Beuren mixed everything in the cupboard toward a recipe for animation’s ideal something or other. There wasn’t a flavor they didn’t try, from would-be funny to way-too cute. A group called Toddle Tales framed cartooned lessons with live-action cherubs whose mild misbehavior merited them. 30’s youngsters in chintzed houses lacking any sort of adult presence are rich preserves of weird incidents you’d not see again in movies. One kid barely walking gorges himself on a seeming barrel of jam that would hemorrhage an elephant’s stomach and learns the folly of that from cartooned animals patterned clumsily upon ones at Disney. A creepy Grandfather clock with human features lectures children on necessity of being kind to smaller clocks (?!). Another short finds a near-infant releasing dozens of mice he’s harvested (but from where?) into sister’s dollhouse. I keep thinking they’re both going to end up with rabies. A disquieting sense of impending crib death hovers over live-action at Van Beuren, this being very much an endorsement for those who like cartoons jagged around edges. Nothing so satisfies as animation working at adorable emerging instead as unhealthy. Here’s where depression-whipped artists exhibited individuality bolstered possibly by ongoing threat of starvation (mention unionizing or a raise and bosses would fire you). There’s a sense of cartoons escaping short of being vetted by at least marginally stable hands. Did I read of one animator’s eye put out by a paper clip spitball launched by a colleague? Not the sort of environment likely to produce buffed to a dull sheen cartoons we’d have later (and certainly now) where pre-viewers and focus group bleed out anything conceivably disturbing. Van Beuren efforts at class which came with transition to two-color Technicolor merely increased strangeness quotients. Separated from Disney Burt Gillett had directed that company’s The Three Little Pigs, a cartoon so phenomenal as to confer unimpeachable status on everyone connected with it. 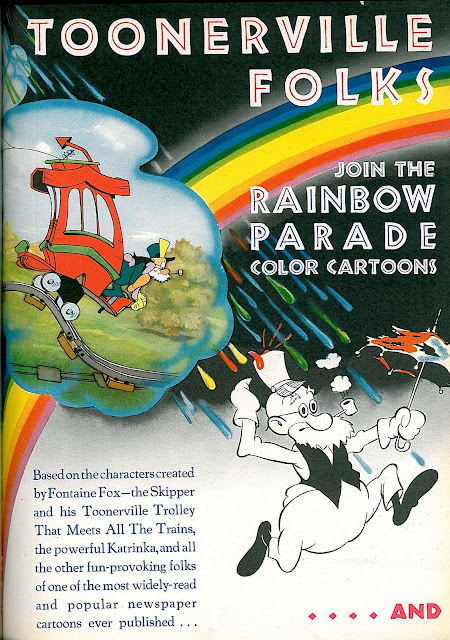 Van Beuren and RKO figured on Gillett waving a magic wand over Silly Symphony knock-offs to be called Rainbow Parade, with antiseptic two-colors as opposed to stunning full Technicolor contracted for exclusive use by Disney. There were puppies and kittens in abundance, but little of the genius W.D.P. routinely applied, despite Gillett’s martinet efforts to whip his team into competitive shape. Frustrated search meanwhile went on for a character to call Van Beuren’s own. Cubby Bear had pooped out after twenty shorts. Some of his were good --- still are --- but really this was just Mickey of a different species and hopelessly outmatched by his inspiration. The Rainbows graduated to full Technicolor once Disney’s contractual grip loosened, and some actually came near touching the hem of Walt’s raiment. 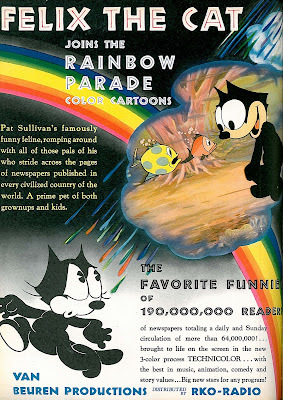 Van Beuren even tried reviving silent vet Felix The Cat as headliner for these, but he crashed surely as misbegotten Molly Moo-Cow, her very name summing up cutesy characters audiences would reject wholesale. RKO might have gone on tolerating Van Beurens but for sudden arrival of Walt Disney himself as releasing partner. To handle Cadillacs meant no further need of jalopies. Pink slips showered upon VB’s New York office and overnight it was cobwebbed. Without a major distributor, there was no way these could continue. The latter fate of Van Beuren’s library makes a saga in itself. Steve Stanchfield outlines all that in very fine program notes with each Thunderbean DVD (historians Chris Buchman and Rex Schneider also contributed). Suffice to say no one bothered renewing copyrights. Eventually they forgot Van Beuren’s very existence (he died not long after the shop’s closure). VB’s were the sort of cartoons you could buy as home movies during the late forties and fifties. They were also among the very first ones shown on television. A sort of immortality thus adhered to Cubby, Molly, and Tom/Jerry, even if slicker shorts with bigger names dashed their fame on arrival to home screens a few years later. Given a choice, what station wouldn’t opt for Bugs and Popeye over Aesop Fables? Van Beurens were budget rentals for those who needed cartoons but lacked funds for recognizable ones. Negatives meanwhile rotted like fruit too long on the vine. 16mm prints are all that’s left of most. The color ones were reprinted, if at all, on lower-grade Cinecolor stock, an enhancement to a bent animated world they depict, but not accurate as to the way VB’s once looked. Part of Thunderbean’s mission has been to get out complete sets on varying series Van Beuren produced. There are multiple Aesop’s volumes, one each for the Little King, Cubby Bear, and the Rainbow Parades, plus more. Quality is remarkable considering how little was done over the years to preserve these cartoons. I’m thrilled with Disney Treasures and Warner Golden Collections, but amazed at Thunderbean’s one-man reclamation of a near-entire Van Beuren library. If you collect or have curiosity for truly offbeat and under-radar cartoons, these are a great place to start (or finish). Incredible article John. I was born in 1952 and yes, I DO have very vague memories of seeing, what must have been, the Van Buren cartoons as a young child. Generally, they showed up on Saturday morning kiddie shows in the L.A. area. Memories of hordes of mice (they were in B&W as we didn't have a color TV set in those days)chasing a bearded old farmer over a surreal landscape to the horizon line in the distance as the title "The End" came up between two stationary elephants standing on their hind-legs......Or the farmer getting "bonked" over the head and his astral-projected body floating among weird galaxies and planets (remember that this was well over 50 years ago and I never saw these cartoons again so my memory might be just a "tad" fuzzy....)Sometimes these memories seem like bizarre "dreams" rather than actual memories....."Did I really see such a cartoon"? Now, after reading your article, it seems that I probably did......I'll definitely check this guy (and his DVD's) out!! Great memories of bizarre moments from Van Beuren cartoons! I'll have to try to track down these that you mentioned, as I'm sure they'll be somewhere among DVD collections from Thunderbean. I hope you're checking out Thunderbean's non-Van Bueren releases. Top of my list is Cartoons for Victory, which mixes the usual Snafus and Hooks with some real oddities, from a lavish, Disneyesque tutorial on camouflaging an air base to a crude little Nazi propaganda short with Mickey and Popeye bombing France. And each of the Cultoons has at least of a couple of jawdroppers. The "elephant" end titles you reference make it clear that what you saw were TV prints of *silent-era* Aesop's Fables, when Paul Terry—who would later split to launch Terrytoons—was still in charge of the VB studio. Terry already had some of his stock company at VB, so the farmer you remember was Farmer Al Falfa himself. Thanks for informative article and here is a link to YouTube where they have a lot of the Van Beuren cartoons. By the way, I didn't start watching TV till the early 70's so I missed these cartoons. I sold PASTRY TOWN WEDDING to Steve on Ebay a few months back. It had been spliced to a Marx Brothers feature I'd bought a number of years ago. I snipped it off, rolled it up and stored it away. I'm so glad it's out there being seen by a new audience of cartoon aficionados! I do remember Felix the Cat cartoons being a staple on Charlotte's WBTV Channel 3 "Three Ring Circus" in the early Sixties, hosted by the singing cowboy Fred Kirby, "Barker Bill"[Warden], and newscaster Jim Patterson in Bozo regalia. I have fond memories of watching these cartoons on the NBC affiliate in Columbus, Ohio. WLW-C (now WCMH) used to air these cartoons with the soundtracks scrubbed and played "beautiful music" over the cartoons. They promoted it as "Cartoons for the Kids and Music for the Moms" as Mom did the housework. It worked as my Mom used to tune into this everyday. It was bizarre watching these cartoons while listening to Mantovani-Living Strings type music. Gracious, John, I never heard of such a thing! Glad they never did that down here. Anonymous, I do remember those Felix cartoons on Channel 3 ---around 1961 or thereabouts. BTW, I got on your blog and put you on my "favorites" list! I adore classic movies and cartoons and finding out more about them (and people such as you and John) is 90% of the fun.....Thanks again! I second John's thanks, Ramapith; after 50-plus years, that was quite a trip through the time machine. I thought I remembered the mummy being a gorgeous babe when unwrapped, but didn't trust my memory enough to mention in -- and as it turns out, I remembered that more accurately than I did the rest of the cartoon (surprised this time, though, to hear Mae Questel's voice coming out of her). But whatever the accuracy of my recollection, that cartoon still (deliciously) creeps me out! Steve's work sleuthing and packaging up odd and outrageous animation of the 30's and 40's is nothing short of amazing. Each DVD he produces is a labor of love, and even if he never gets rich from this, his contribution to preserving the memory of these little films is invaluable. To me the most amazing work he has put forth thus far is the Rainbow Parade disc. Not because they are great cartoons, (well "Sunshine Makers" might be, and Steve's transfer of this title blows away any you've ever seen! )but because they are so rarely found, at least in color form. Animation film collectors know this, and Mike Johnson didn't mention it, but his "Pastry Town Wedding" print sold for way more than he'd likely get for the feature film it was attached to. While Dave Sheppard has the technicolor source materials for the 1935-36 color product, (Cartoons That Time Forgot anyone? )the source materials for the earlier 34-35 season are lost. Steve spent years putting together this collection....and it couldn't have been done without a lot of help from the film collecting community! I was born in 1948 in a Boston suburb. In my years glued in front of a 13 inch black and white set watching Saturday morning cartoons, Farmer Alfalfa cartoons were a staple. 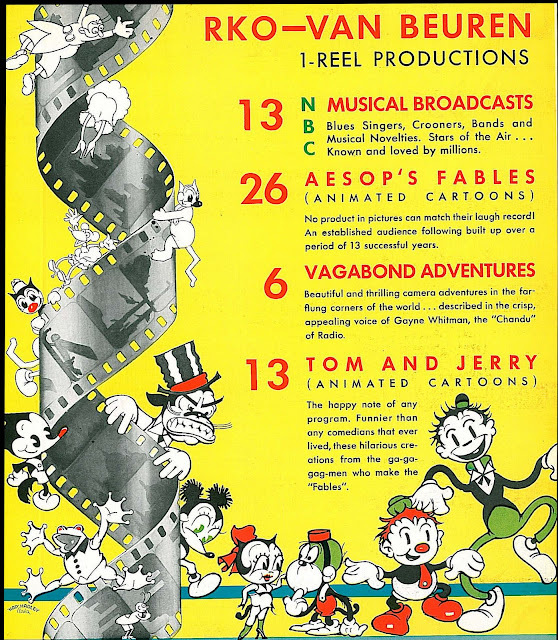 The three local network affiliates -- there were no UHF stations yet -- would also include as "cartoons" Lotte Reiniger's silhouette animation shorts with added sound effects. We kids would watch anything, but not until Crusader Rabbit and Mighty Mouse appeared in the mid-1950s was there anything really memorable. Popeye cartoons were great, but you usually had to sit through some bush league kids show with an adult host before the cartoon would come on. Thus, when Hanna-Barbera came out with Huckleberry Hound, Yogi Bear, and their various supporting segments, all of which played in the evening instead of in the Saturday morning ghetto, we thought we had landed in cartoon heaven. Nevertheless, I applaud the remarkable effort being put into restoring the van Beuren cartoons, because posterity may find values in them that I can't discern. I'm trying to think of a cartoon series that was based on a successful comic strip that was successful in its own right. (Superman was a comic book, not a strip.) Compare Bill Hanna's "Old Smokey," a Captain and the Kids cartoon he did just before he and Barbera teamed up to create an original cartoon with Puss Gets the Boot, the first in the Tom and Jerry series, and you'll see the difference between an animator tied to a venerable comic strip and someone free to work on his own creation. Van Beuren's Amos and Andy series would be an interesting cross-reference to Calvin and the Colonel. IIRC, one of Correll's sons played a major role in the disastrous Time-Life versions of Harold Lloyd films. Ch. 38 in Boston ran a lot of these in the mid-late '60s. 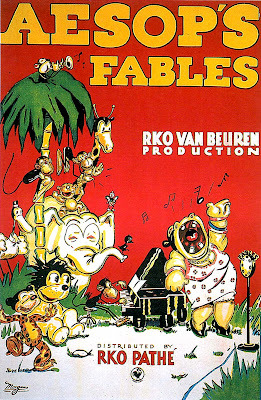 One of my favorite things about the Van Beuren cartoons, especially those from pre-1934, are the music scores. Lots of stock late-silent film music (not a complaint at all...I find that stuff fascinating), plus interesting performances of then-current popular songs. The cartoon mentioned, "The Magic Mummy" (2-7-33) is a perfect example. In it we get to hear two hits of the day that are just about totally forgotten today: "The Cop on the Beat, The Man in the Moon, and Me", and "Sing (It's Good For You)". Being a collector of such stuff, these two songs are familiar to me and I have 78's of them by singers and bands of 1933, and it's always a treat to hear them in old films. Also, another note of interest about the Van Beuren cartoon music scores, which is also true of the scores they recorded for their reissues of Charlie Chaplin's 12 Mutual shorts (1932-1934) is the personnel. Some of the top session players and future starring bandleaders such as Benny Goodman can be heard on those soundtracks. There is a new book on Van Beuren a cartoon synopsis book selling on Ebay.